Naughty Dog raises the bar yet again. 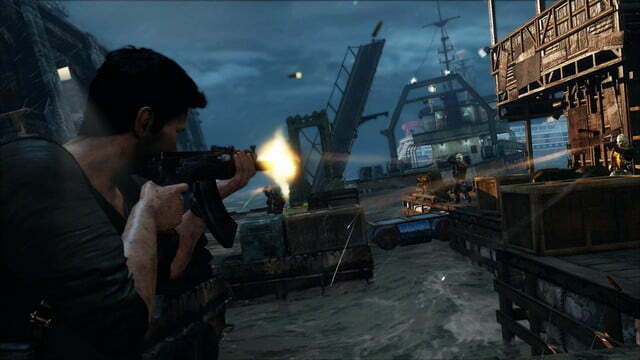 While the graphics in Uncharted 3 may not have the same photo-realistic quality that some games like Battlefield 3 may have, Naughty Dog uses what it has better than any other game on the PS3. The sand effects — of which there are a lot — are breathtaking, and the use of shadow and light are often times amazing. The cities and exotic places you see may not have the same detail as some games, but the design, the lush look and the originality are second to none. 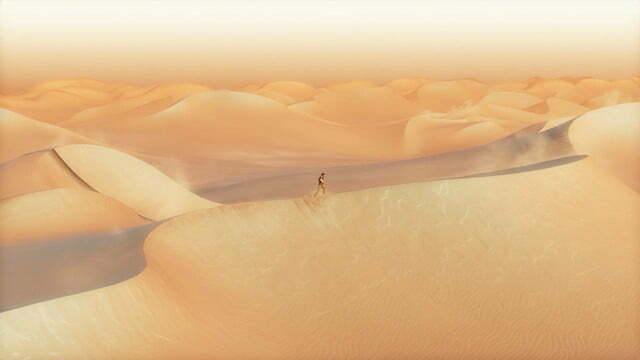 Other games may have more graphical horsepower, but few will ever look as good as Uncharted 3. 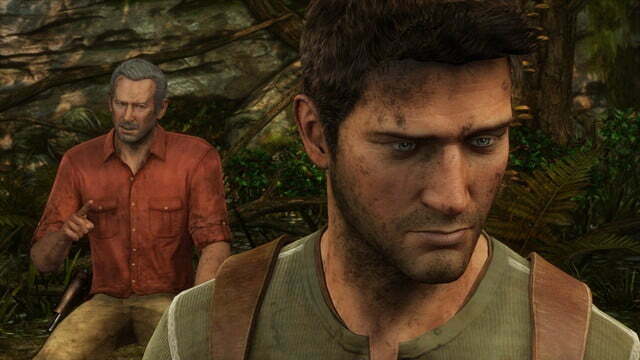 Uncharted 3 looks closer to an animated movie than a live action one, and that fits perfectly for this game. There are a few slight technical limitations, though, and they can crop up randomly. More than once I found myself facing a game-ending glitch, where an enemy went Kitty Pride and phased into a wall, never to return (and thus never to die and let me advance). I also once found myself inside of a mechanism for a few minutes before I realized that this was not a place Nathan was meant to go, and the sound also went out a handful of times. These are minor, but the combination of these admittedly rare glitches, plus the lackluster AI, are worth noting. When the game does things wrong, you can quickly overlook them once the problem is resolved. But when it does things right, it does them to near perfection. Naughty Dog once again proves that it is a master at tricking you into thinking that you are being totally creative. As you run from enemies avoiding gunfire, you may just barely glimpse a ledge that you make a dive for, then pull yourself up and run, high-fiving yourself for you awesomeness. Only then do you realize that you were supposed to go that way. It is genius. Time and again you will feel that you are on the verge of being out of control, and time and again you will feel like you just barely survived through a combination of luck and your own incredible skill. That’s what Naughty Dog wants you to think. Its designers are master story tellers, and the level design is one of the tools they use to full effect. The campaign is what will make Uncharted 3 legendary, but the multiplayer is what people will come back for. 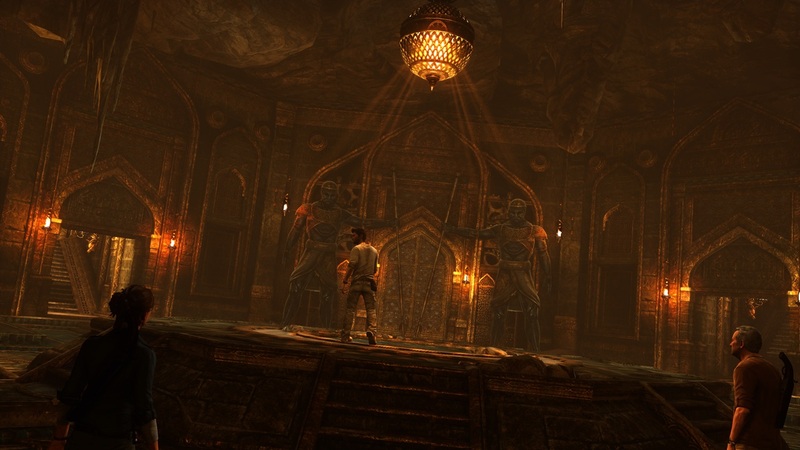 In Uncharted 2, the multiplayer was a valiant attempt, but it just couldn’t offer much compared to some of the online-specific games. It was fun, but it wasn’t ever going to convince people to abandon franchises like Call of Duty or Killzone for it. In almost every way, the multiplayer in Uncharted 3 is better. It still has a few issues, but it is improved from the last game. The biggest change is that a handful of the levels are designed to emulate the set pieces from the single-player. If you have been following the development of the game, then you have probably seen the cargo plane level. It begins with you either on the plane, or on a truck chasing the plane. The gun fight goes on as you try to either get onboard or hold the plane, then it switches to a more traditional map set in the hangars. There are other levels like that as well, which begin in an action scene then cut to the main fight. They are a welcome addition, and something more online games should consider. Along with the traditional Deathmatch, Plunder and objective-based games, are a few new treats like the Co-op Arena that is essentially a horde-survival mode, where you and two friends take on waves of enemies. Building on that is a highlight of the multiplayer, the Co-op Adventure, which is similar to the Arena, but offers a mini-campaign of sorts. While these co-op challenges are fun, most players will probably gravitate towards the more traditional competitive modes. If you have been to Subway recently, then there is a good chance you have been playing the multiplayer for a while now through giveaway codes. Those who got in early will be happy to see their stats transfer over to the retail version of the game. In theory, the multiplayer is well thought out, but in practice it plays a bit like BioShock II’s online games. That isn’t necessarily a bad thing, but the competitive levels are multi-tiered, and enemies can take (and dish out) a lot of damage. This means that you will frequently get hit from an unknown location, then escape only to have a random enemy turn a corner and shoot you. This is also frustrating when you are working on an enemy and someone else wanders over and accidentally steals your kill. It just feels imprecise at times, and the lack of a HUD doesn’t help. Once people learn the levels and unlock better weapons through the progression system, this should disappear a bit, but it is a steep learning curve that many will find hard to embrace. If you do stick with it though, there is a lot to like. New to the series are boosters, which are essentially perks that can be leveled up. Joining them are kickbacks that you can use by earning medals, which the game awards for all manner of things. These kickbacks can also be purchased, and offer things like an RPG or multiple grenades for a limited time. 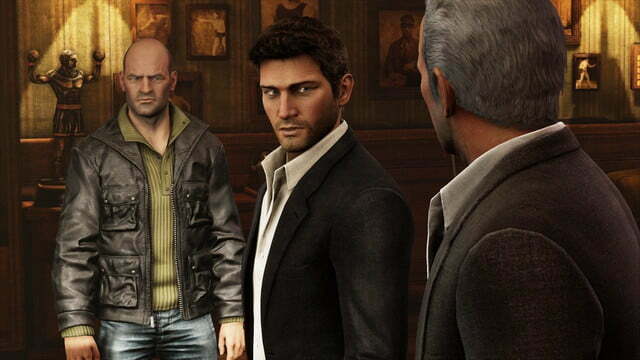 Uncharted 3: Drake’s Deception is a masterpiece. There are a few tiny blemishes that are easy to overlook, but in general it is the best movie you will play this year. The pacing of the levels is extraordinary, and while the combat can occasionally drag, that is usually just because you will be so into the plot that you want to see what happens next. The multiplayer is also a major improvement over the last game, and can stand on its own as a top-tier online experience. Keep in mind, though, that it won’t appeal to everyone, especially fans of online first-person shooters. It may be a bit pretentious to claim that this game is art, but it uses the medium of video games to its fullest and creates an experience unlike any other. Easily one of the best games of the year, Uncharted 3: Drake’s Deception is likely to be remembered for years to come.